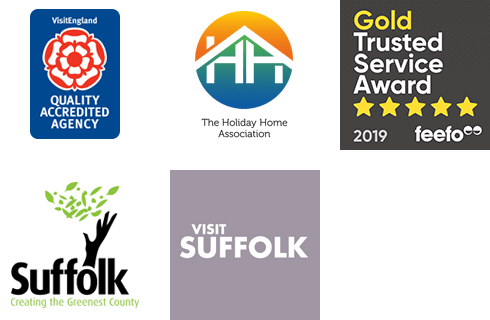 The Suffolk countryside is a beautiful area to discover and we offer some wonderful holiday cottages in this part of the country which are all listed below. Choose from a selection of cottages in lovely destinations such as Lavenham, Long Melford, Bury St Edmunds, Laxfield, Wissett, Kersey and more. To find out more about our Suffolk countryside cottages, keep on reading! Relax and unwind on your well-earned break with one of our cottages in the Suffolk countryside. With its rich agricultural heritage and traditional villages such as Monks Eleigh, this area is a lovely place to base your holiday. There's an abundance of locally produced food and drink on offer alongside a great choice of farmers markets, traditional butchers, smokehouses, farm shops and cosy pubs. Our cottages located in this part of Suffolk offer a great opportunity to explore the local scenery, heritage attractions and some charming towns and villages. What can I do in the Suffolk countryside? Blessed with picture-postcard scenery featuring a patchwork of multi-coloured pastures, the Suffolk countryside offers a truly delightful destination for your holiday with friends or loved ones. Offering miles of unspoilt walking and cycling trails alongside medieval towns such as Lavenham and Kersey, you'll be spoilt for choice when planning all the things to see and do in the area. This thriving area has an abundance of lovely towns and villages to explore, the largest of which is Bury St Edmunds, where you'll find Suffolk's only cathedral. Home of the beautiful Abbey Gardens, Bury St Edmunds has lots of historic streets, buildings and lanes to explore which are brimming with shops, eateries and quirky bars. Wander around the historic Angel Hill and then stop off for a quick refreshment in The Nutshell - Britain's smallest pub! Our Suffolk countryside area includes a range of character-filled cottages in Lavenham - one of Britain's best preserved medieval villages. Wander around the stunning Lavenham Market Place and visit Little Hall or the Guildhall of Corpus Christi to find out more about the town's fascinating history. Lavenham and the nearby villages of Kersey, Cavendish and Clare, are collectively known as the Suffolk Wool Towns as they were historically very prosperous due to a thriving textile industry. Lavenham is one of the most beautiful of the wool towns and it also holds the title of having the 'Best Farmers Market in Suffolk'! Held on the fourth Sunday of every month, it is well worth the visit where you can expect to find the very best of Suffolk produce – perfect for taking back to your self-catering cottage. Nearby, you'll find the charming village of Long Melford. With its picturesque village green and an historic high street filled with antique shops, galleries, tea rooms and boutiques, it's a truly lovely destination to stroll around. Long Melford is also home to Melford Hall which is a fascinating and beautiful National Trust property. Nearby, Kentwell Hall with its costumed Tudor re-enactment weekends, is a great place to visit with the kids where they can experience games, pageants and music - all in a Tudor style! What type of holiday can I have in the Suffolk countryside? With its stunning, unspoilt countryside and myriad walking and cycling routes, this area is perfect for those who like to discover the great outdoors. For those looking for a pet-friendly holiday, we're sure this area will be a hit as you can take your dog with you on many of the walks, and around the scenic towns and villages. If you want to bring your four-legged friend with you, simply book one of our dog-friendly cottages. For those with an artistic flare, there are plenty of options to get your creative juices flowing. The Glass and Craft Centre at Kersey Mill offers lots of fun for all the family where you can create special pieces of glassware to treasure long after your holiday has ended. Many of the beautiful villages throughout this area also offer a good selection of galleries and antique shops. Want more information on the area? There really is a lot to offer in the area, to find out even more click here for our local guide on things to do in the area and upcoming events. Start planning your Suffolk holiday today. Why not discover more about the Suffolk countryside and the locations it has to offer by clicking here. From charming villages like Parham to stunning medieval towns such as Lavenham and Kersey, the Suffolk countryside has many stunning destinations to discover. A cosy self-catering cottage in the heart of the popular village of Lavenham - perfect for couples or small families. If you are couple looking for an escape from the modern world to a simpler way of life then this cottage may be just what you are looking for ... Meadowsweet Cottage is a traditional timber-framed Suffolk Cottage that has been lovingly restored by the owner. For lovers of style - No. 2 Constable Court is fresh, modern and inviting! This newly built holiday home is located in the historic village of Lavenham within the Suffolk countryside. This charming character cottage is full of countryside charm and ideal for couples looking for a romantic retreat in which to explore the pretty village of Kersey. The Dairy is a luxurious self catering holiday cottage located on the outskirts of Lavenham. This beautifully decorated, contemporary cottage located in the middle of the Suffolk countryside is the perfect home for your family holiday. Relax in the beautiful garden with its own orchard or explore the nearby village of Old Newton.